As always, everyone’s case is different, but, if it is possible, both parents should be actively involved in preparing for the holiday. The children might tell each parent something different in terms of what they want their costume to be. Communication is key in co-parenting, even more so around the holidays. So speak with each other and decide on what costumes the children will wear and what neighborhoods they will trick-or-treat in. It may be possible for the children to have two different costumes if celebrating separately. Either way, be on the same page. If your relationship with your ex allows it, go together with the children for trick-or-treating. This is only for those who can seriously spend time together without bickering over what candy the children should and should not accept, and what houses are deemed appropriate to visit. It is better to acknowledge your inability to get along than subject your child to arguments that may take away from their Halloween fun. If spending the holiday together with the children is not possible, there are other ways to be sure both parents are able to partake in festivities. 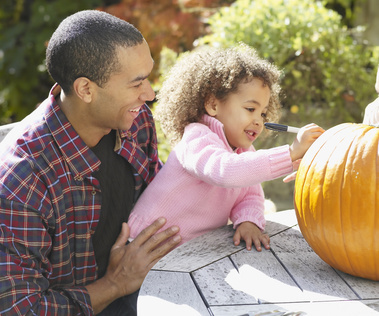 If both parents live close to each other, try spending an hour with each parent for trick-or-treating. This will likely not work for most people, however, there are other opportunities to share in the fun if you are not the custodial parent on Halloween. Often times schools will have costume days, or you and the children could attend a local “Trunk and Treat” that falls during your custodial time. Some towns will have fall street festivals on the weekends which would be a perfect opportunity for you and the kids to get out, dress up, and celebrate the season. Regardless of your relationship with your ex-spouse, you have the ability to make and keep Halloween fun for your children. As with all holidays, if Halloween does not fall on your custodial time, do not guilt the children for having fun with the other parent. Make your own plans that day and take some time to treat yourself this Halloween.